There are eight kinds of link building practices that Google can identify and stop from passing PageRank. Most of the examples have links to research, patents and statements from Googlers to validate that this is possible. This a mistake that anyone can make. There is a patent from many years ago that is about taking note of changes to a web page, including inbound and outbound links, then making a determination of whether or not these are spammy or natural. This patent is called, Information Retrieval Based on Historical Data. Google has snapshots of the web, including snapshots of the state of the linking patterns. The most common and easily detectable mistake is adding a link to an existing web page. This patent dates from 2003. Matt Cutts, the head of Google’s spam fighting department is listed in the patent as one of the authors. That’s a good sign that this patent has a strong anti-spam component. Among the various things this patent covered, one of them was tracking changes of links on a web page. How often links are removed from a web page. This patent covers a wide variety of changes to links on a page and links to a web page. The method of claim 26, wherein the measure of freshness of a link associated with the document is based on at least one of a date of appearance of the link, a date of a change to the link, a date of appearance of anchor text associated with the link, a date of a change to anchor text associated with the link, a date of appearance of a linking document containing the link, or a date of a change to a linking document containing the link. Link selling was a multi-million dollar business in those years. Around 2006 to 2007, Google was able to identify which links were paid and began devaluing them. I know this because an executive from a link selling businesses told me that many of the links they sold were increasingly no longer working. There were multiple theories. In retrospect, something like the Historical Data Patent could be used to easily spot paid links. Google could simply keep an eye out for web pages that were adding and removing links. One way Google could detect paid links or some poorly managed Private Blog Network (PBN) links, is to monitor the inbound/outbound link changes that are coming and going from pre-existing web pages. Web pages change all the time. But there are some changes that are typical to spammy additions and subtractions to links. These are time based and also involves monitoring the anchor text. Adding links to previously published articles in an attempt to influence Google may be one of the most common mistakes that backfire on link manipulators. Typically the link may work for a few weeks to a few months. Then the links stop working and the site begins a slide in ranking. This is an example of a sketchy link building tactic. Offering something in return for a link is a paid link. Overstock.com was reported to be penalized by Google in 2011 for offering discounts to university students in exchange for links. Overstock.com apparently was offering universities discounts in exchange for links to their product pages. A university published a PDF document with discounts that was intended for students. 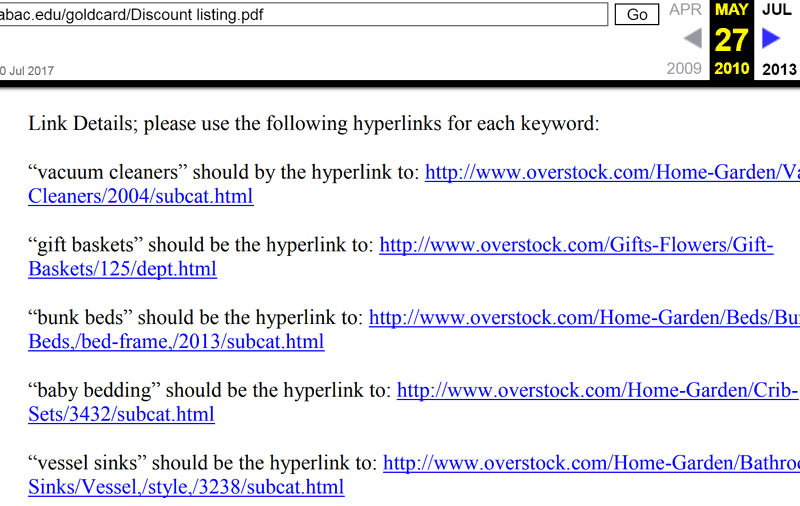 Unfortunately for Overstock.com the document apparently contained the text of the outreach with instructions for how to link to the Overstock.com product pages. The PDF doesn’t exist anymore but Archive.org has a snapshot of it here. For some reason people are still recommending discount link building. As you can see from the link above, this tactic is burned, it’s bad news. Don’t do it. This is another variation of a paid link. Interesting thing about this tactic is that it can actually be illegal because it may violate FTC rules against publishing reviews that have been paid for with products, samples or other compensation. This is not about guest posting. This is about a different form of content marketing. Content marketing is a lot of things. A valid version focuses on publishing articles on one’s own site to establish the site as a thought leader and create a useful resource that generates good will and links. Another version of content marketing is hiring a writer to publish an article on a third party website, with a link to the client from within the article. These kinds of article links do not typically contain a disclosure that a payment was made to the writer for the article and the link. This is advertising. When money or other consideration is exchanged for a link, that is considered an advertisement done for promotional purposes. “I’m a blogger, and XYZ Resort Company is flying me to one of its destinations and putting me up for a few nights. If I write an article sharing my thoughts about the resort destination, how should I disclose the free travel? The following rule is from the FTC’s .Com Disclosure guidelines. Here it states that an advertisement must have a conspicuous disclosure. If it is not possible to place that disclosure within the context of the advertisement then that context should not be used. This may apply to the context of an article that is written on behalf of a client and published on the website of a third party. For hypothetical example could be a major web host might contract with a content writer specializing in technical articles about WordPress, SEO, and so on. That writer might also be placing links within the articles to their clients, unknown to the blog itself. That’s an advertisement on behalf of the writer’s client that is being placed on the web host’s blog. The following FTC guideline states that if the advertisement cannot be disclosed ( as in a hidden arrangement), then that advertisement should not exist. Viral link campaigns can be useful. A viral link campaign can be useful if it is highly targeted to the demographic of people who would become purchasers and results in links from relevant web pages. In my opinion, some of the value in viral link campaigns lie less in link creation and can be in awareness building. Building awareness for a company has value. However, the more general the campaign is, the less likely that it will result in relevant links. In that scenario, the value may not exist in the context of ranking, link building and SEO. Creating a viral contest or other form of viral stunt to obtain links may often result in irrelevant inbound links. Google discounts irrelevant links. The page and/or the immediate context of the link must have a meaningful relevance to the site being linked to. If the relevance of the link is for the topic of the viral campaign, then those links may help rank that site for that topic. A friend shared with me the anecdote of a company that ran a campaign for their real estate company. The campaign was a contest to about the world’s worst real estate agent portrait photograph. For years afterwards the real estate site failed to rank for meaningful phrases but it did receive a lot of traffic for phrases like world’s worst real estate agent. Now imagine bloggers and news organizations linking to a toy retailer website because the toy retailer created world’s biggest teddy bear. All the links have the context of World’s Biggest Teddy Bear. The landing page they’re linking to is the viral link page about the world’s biggest teddy bear. That site will rank for world’s biggest teddy bear. But those thousands of links will not help that site rank for their important search queries because none of those links come from the context of a specific toy nor do they link to a specific toy. So how can that site rank for yo-yo’s when all their links are about world’s biggest teddy bear? It won’t. They never do. I gave a presentation at an Internet marketing conference several years ago and one of the audience member was confused at why his wildly successful viral link campaign failed to increase rankings and sales. The above description is why irrelevant viral link campaigns fail in terms of creating lift in rankings and sales. Don’t overlook the value of building awareness with a viral link campaign. Viral linking as a strategy can be useful. Just don’t expect an off topic viral campaign to result in a change in rankings. While we’re on the topic of viral links, this is a strategy that no longer works. This strategy dates back to the days of when Digg was popular. The scheme was to build a ton of viral (irrelevant) links to a viral link page. Then months later take the page down and do a permanent 301 redirect to the home page or to a product page. This no longer works and hasn’t worked for many years. Google will not assign PageRank or relevancy signals through a redirect (or canonical) if there isn’t a one to one relevance between the two pages. In my opinion, it is very unlikely that a Philanthropic event will generate links from a meaningful context. This is similar to a viral link campaign. The best links are from a context that’s related to your topic to a page on your site that is about that topic. A one to one match. This kind of link is convenient and expedient. That’s why some SEOs may recommend them. They’re easier to acquire than creating the situation that results in an actual high quality link. It’s not really the kind of link that will move your rankings. I say this from personal experience with my own websites. I and others experimented with these around 14 years ago. This is nothing new. They simply do not move the dial on rankings. “…if with your website you’re sponsoring… different clubs and sites where it looks like the primary intent is to get a link there, then that’s something the web spam team might take action on. PageRank and link ranking algorithms look at how the web interconnects. Google builds a map of the Internet then likely creates what’s called a Reduced Link Graph, consisting of mostly non-spam links and pages. Then as part of the ranking analysis it organizes the web into neighborhoods by topic. Now think about it. Is there a valid topical relationship between a scholarship page and a site about Best Mattresses or about web hosting? No. In a normal map of the web, a page about scholarships has zero relevance to a website about web hosting and most any other niche. The definition of expedient is, “convenient and practical although possibly improper…” Scholarship links are an expedient solution to a difficult problem. What makes it improper is that the link generated from such a transaction (it’s a paid link after all) is not relevant. So it’s not going to move your rankings. An SEO may say that a link from a .edu will help increase the domain authority of a page and make it look trusted. Well, that’s wrong in three different ways. 1. No such thing as domain authority. 2. No such thing as a trust metric in use by Google. 3. Dot EDU links are not special because of their domain. Being fashionable is about going along with the current trends. Like fashion, link building has many trends, sometimes driven by a lack of understanding of how links work. When it comes to link building, it’s good to understand the history behind certain tactics. It’s also useful to understand how search engines use links. Knowledge will help keep you from making avoidable mistakes. Don’t let anyone tell you that knowing about patents or research is useless. Knowledge is useful. Understanding how search engines treat links can save you from needlessly tanking a website’s rankings. There are so many ways that a link building strategy can go wrong. These are, in my opinion, a few of the ways that a link could end up not counting or helping a site rank well.